amfAR and its success. amfAR, The Foundation for AIDS Research, is one of the world’s leading nonprofit organizations dedicated to the support of AIDS research, HIV prevention, treatment education, and advocacy. Since 1985, amfAR has invested more than $480 million in its programs and has awarded more than 3,300 grants to research teams worldwide. Celebrated Halloween as the Official Wine & Spirits Partner of The Fabulous Fund Fair Benefitting the Naked Heart Foundation and amfAR New York, NY October 29, 2017. Moët Hennessy, the Naked Heart Foundation and amfAR, The Foundation for AIDS Research, joined forces for the first time to hold a magnificent Halloween edition of The Fabulous Fund Fair in New York City. This was a fabulous fun-filled frightful carnival complete with whimsical stalls, games, amusements, luxury prizes, celebrity hosts, cocktails, champagne and delectable treats. With Moët Hennessy’s support, amfAR has been able to fund 18 Innovation grants to scientific teams that include 74 scientists in all, as well as invest in game-changing, multi-year projects like the amfAR Institute for HIV Cure Research, the only consortium of its kind in the world. 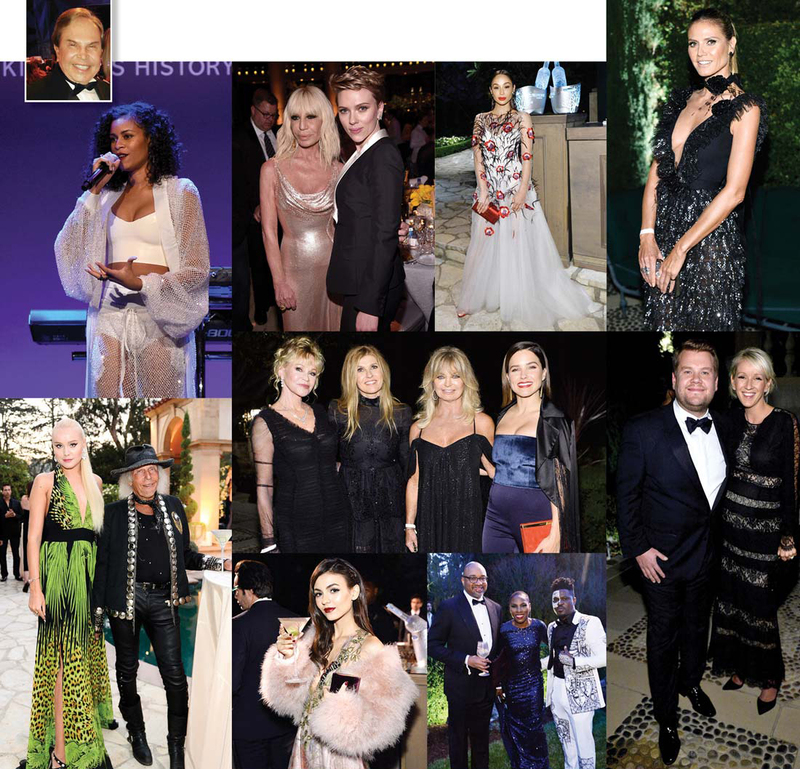 The 24th annual amfAR Gala Cannes raised more than $20 million last night in support of amfAR, The Foundation for AIDS Research, and its pursuit of a cure for HIV/AIDS. The star-studded black-tie event, held at the Hôtel du Cap-Eden-Roc in Antibes, France, during the Cannes Film Festival, was presented by Harry Winston and Bold Films. Event Chairs in attendance included Jessica Chastain, Dustin, and Lisa Hoffman, Nicole Kidman, Diane Kruger, Eva Longoria, Carine Roitfeld, Harvey Weinstein, amfAR Chairman of the Board Kenneth Cole, amfAR Global Fundraising Chairman Milutin Gatsby, Len Blavatnik, and amfAR Trustee Vincent Roberti. VIP guests such as Leonardo DiCaprio, Will Smith, Diana Ross, David Beckham, Dionne Warwick, Uma Thurman, Adrien Brody, Jean Paul Gaultier, Irina Shayk, Karolína Kurková, Bella Hadid, among many others. Event Chairs Nicole Kidman and Dustin Hoffman opened the evening by welcoming guests, noting that their presence “keeps the fight against AIDS in the global spotlight, reminding the world that we can and must end this deadly epidemic that has already claimed more than 35 million lives.” Eva Longoria after thanked the event’s sponsors introduced amfAR Chairman of the Board Kenneth Cole. He stressed that “ending AIDS is not a fantasy, it is a goal within our reach,” mentioned that in less than three years amFar had awarded grants totaling close to $40 million to support HIV cure-focused research. Conducted by more than 150 scientists working at 55 institutions in 10 countries around the world. The Foundation for AIDS Research is one of the world’s leading nonprofit organizations dedicated to the aid of AIDS research, HIV prevention, treatment education, and advocacy. Since 1985, amfAR has invested more than $480 million in its programs and has awarded more than 3,300 grants to research teams worldwide. Moët Hennessy, Official Wine and Spirits Partner, of amfAR Gala Los Angeles, California, October 14, 2017 –Moët Hennessy was proud to participate in the 8th annual amfAR Gala Los Angeles as a Signature Sponsor and as Official Wine and Spirits Partner of amfAR, The Foundation for AIDS Research. Throughout the evening, guests enjoyed champagne, wine, and spirits from Moët Hennessy’s prestigious portfolio. In one of the highlights of the night, Belvedere Vodka offered a personalized Belvedere Bespoke Silver Saber magnum for each guest who pledged $500 or more to amfAR. To further support amfAR’s fundraising, Moët Hennessy offered a one-of-a-kind, live-auction lot explicitly created for amfAR Gala Los Angeles, an Australian Wine Excursion with Cape Mentelle.